From mountain backdrops to beautiful architecture. From picturesque mountain backdrops in British Columbia to the state-of-the-art sustainable campus buildings in Ontario, Canadian universities and colleges are home to some stunning architecture. With students going back to school and the rest of us remembering what it was like all those years ago, it's time to recognize and appreciate some of the country's most impressive campuses and buildings. Last year, we created a list of the most beautiful campuses in general, but this year, we're narrowing things down to a single building. From modern and flashy architecture to castle-like halls that have been around for decades, we took a look at buildings with classic histories, cool features and campuses that are thriving with greener spaces. Of course, we couldn't include every single institution in Canada, so let us know, which building would you add to the list? 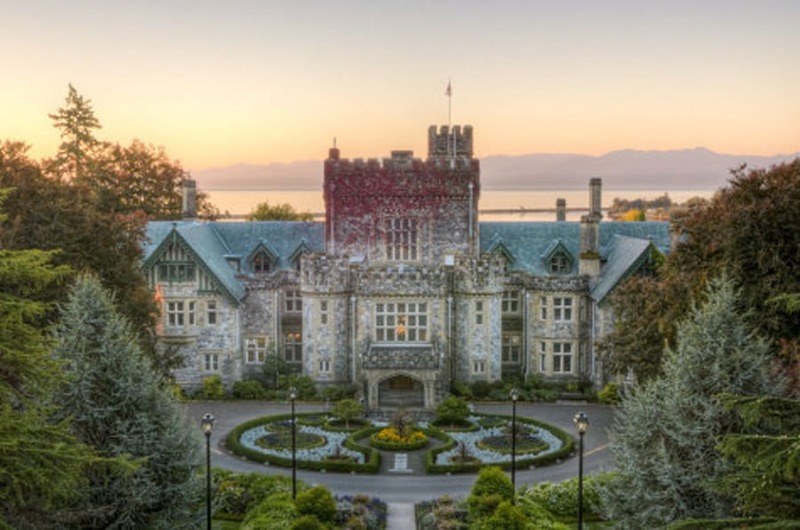 You may recognize this stunning castle from the "X-Men" movie series — or the 33 other major pictures that used it as a backdrop. The National Historic Site, which is located on the Victoria campus, offers guided tours and a wonderful garden. It also include a billiards room, drawing room and a dining hall on the main floor, as well as administrative buildings. This Regina-based campus building is covered in Tyndall stone from Flin Flon, Manitoba that's over 190 million years old. If you look closely enough, you will even find fossils! George Martin Hall is in the heart of this Fredericton campus. It is home to the offices of student services, the university's main dining hall and classrooms. Located at the corner of downtown Toronto's Yonge and Gould streets, the SLC offers space for students to study, work and share ideas. Inside, levels of the SLC include quiet study spaces, casual study spaces and pretty cool furniture. Built in the late 1800s, Wesley Hall is home to a high school and houses administration offices. This picturesque building was opened in 1915 and features two nine-foot grand pianos. The Kamloops, B.C. building is Canada's first new law school in the last 30 years. The buildings hold a law library, law clinic and moot court. After the original Macdonald Engineering Building was gutted by fire in 1907, this building was constructed with function and safety in mind. However, there was one design feature that was different: this building includes a phoenix rising from the ashes as symbol of rebirth. Equipped with everything from labs to greenhouses to a conservatory, this science centre also includes an auditorium. The university's Business and Information Technology Building has a complete green rooftop, heating and cooling from a geothermal well field, and labs made for students. University Hall is one of the original buildings at this Hamilton, Ont. campus and features Gothic architecture. Right at the entrance of this Edmonton campus, this building (which features a giant clock) is the gateway into the school's core. The BOSA Centre for Film and Animation is home to the university's film making space. Home to the university's administration offices, as well as lecture halls. And because of it's architecture and classic look, several people have their wedding photos taken on the hall's steps as well. This London, Ont. campus building is filled with lecture halls, classrooms and offices. And with so many stunning sights at Western, this one definitely sticks out. One of the coolest buildings in downtown Toronto, OCAD's design centre is made with 12 giant pencils (six multicoloured and five black ones). For the best views of the building, check it out at night. This Halifax-based building was built in the 1920s and designed by architect is Andrew Cobb. It was actually modelled after the university's original campus in Windsor, Nova Scotia. Located in Windsor, Ont., Dillon Hall is one the university's oldest buildings, originally built in 1928. At first, the hall housed high school and university-level students, but today it holds university classrooms. U of T may have several impressive buildings, both new and old, but we're huge fans of the Thomas Fisher Rare Book Library located at Robarts. The library houses books, manuscripts and other materials for staff and students. And Robarts itself is a unique architectural gem itself. The Ontario university's newest campus building is made with sustainable wood products, recycled steel and has a two-storey, plant-covered living wall. In fact, in 2012, it also earned platinum status for Leadership in Energy and Environmental Design. Located on the Mont-Royal Mountain in the heart of Montreal, this building is home to the school's medical and science programs. Construction started in 1929, but was stopped in the '30s due to the economic crisis. It was fully completed in 1943. And while the building itself may not be modern or flashy, we like the fact that it holds together a much larger campus. This building is a sight to see, especially these pyramids. This Ontario university's Johnston Hall is one of the campus' best known landmarks, filled with both administrative buildings and a residence. This curvy building is home to classrooms, break-out rooms and labs for student use. It also faces the Tantalus Mountain Range in Squamish, B.C. Constructed in the '60s, the Academic Quadrangle building at SFU serves as a space for several faculties, including Canadian studies, gender sexuality and women's studies and International Services. Built in 1912, this Winnipeg-based administration building was one of the first buildings on campus. Samuel Hooper, who designed the building, never received any formal education in architecture. The Halifax-based building, which includes outdoor picnic tables and a ton of green space, is home to the university's Registrar's office, administration offices and classrooms. The main building, located in Winnipeg's St. Boniface neighbourhood, houses two gyms, a library and a chapel. USB is the oldest post-secondary educational institution in Western Canada. Completed in 1903, the Kingston, Ont. 's building has been used for several purposes over the years, but these days it is home to several art studios, an art library and display rooms. Located in Charlottetown, SDU Main Building was first opened in 1854. After housing everything from classrooms to a chapel to even a college, today the building is home to the university's faculty of arts.